First off, how breathtaking is the cover? The fact that it's underwater lends it a beautifully eerie feel to it, and I can't wait to see how the cover of the last book of the Mara Dyer trilogy turns out. 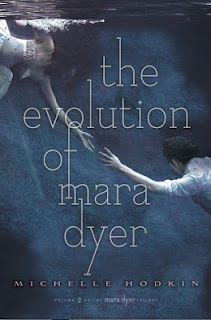 "The Evolution of Mara Dyer" is the second installment to the trilogy, and was released last month in October--and not a day too late! The novel begins right where the first book ended, and propels you forward with thumping hearts and white noise. Mara knows that Jude, her ex-boyfriend who was supposed to have died when an abandoned asylum crushed him, is alive. But everyone--the doctors, her parents, everyone--thinks otherwise, that she's insane. The only one who'll believe her, even when she's stuck in rehab, is Noah. Noah, who also possesses an unwordly power of healing, the polar opposite of Mara's ability to destroy. When violent, disturbing things start showing up around Mara--a picture of her with her eyes scratched out, a gutted cat--she knows it can only be Jude. But what can she do when he really might be nothing more than a ghost--and what will become of her? One of the things I loved in the book was Noah and Mara's relationship. It was so believable, so real that it made them more relatable and sweet. Instead of the goopy, cliched "I love you oh my goodness I will never leave your side"stuff, what Noah and Mara had between them was undeniably un-fantasized. While it was so obvious that Noah did love Mara and would do anything for her safety, you could really see that it wasn't just a head-over-heels unconditional love. Instead, there was a sort of grit in their relationship which really made it real. Their believable, realistic, likable relationship probably also had to do with the characters themselves. Despite the whole everyone-believing-you're-insane and evil-ex-boyfriend-back-from-the-dead problems, Mara deals with everything just as a strong girl would. Her wry humour and wit also had me laughing at times, and she never got annoyingly worried or distressed, which is impressive considering what she has to deal with. Now onto Noah. Arrogant yet heartwarmingly sweet Noah is a perfect partner for Mara, and I just loved how despite the fact that he has to be the 'grounding rock' for his girlfriend, he still has hidden problems of his own. I think that this is one of the things that really made their relationship so hauntingly relatable and real--the characters themselves aren't even close to perfect, but they still try to make things work together. It's just an incredibly mature relationship, with the spark and passion of a teenaged one. The story itself was just plain creepy. Really. It gave me the heebie jeebies. It had my heart beating a mile a minute and had me glancing out the window at night to make sure my creepy ex-boyfriend wasn't about to slice me to pieces or anything. The plot is extremely well woven together, and Ms. Hodkin manages to balance the scary parts with other ones, some sweet, some funny, some light. I liked how you learned a lot more about each of the characters as the story progressed, especially some juicy stuff about both Mara and Noah's histories. "The Evolution of Mara Dyer" is a haunting yet beautiful book about love and vengeance. The unglamourized relationship between Mara and Noah especially cinched the novel, and the compelling storyline definitely didn't hurt too much either! I definitely recommend reading the trilogy--it's a creepily wild ride you won't want to miss!